SOD BLITZ 2019 is coming in May! Click the link to learn what’s involved. Kim Corella, CALFIRE, RPF#2916,Southern Region Forest Pest Specialist/Forester II, Los Osos, CA 93402, Kim.Corella@fire.ca.gov, Cell – 805-550-8583, invites all interested to attend the invasive shot hole borer (ISHB) and goldspotted oak borer (GSOB) workshop in San Luis Obispo, May 9th from 9:30-2:30. For more information on the training and to register, please click on www.pshb.org. At the workshop, participants will learn how to identify these invasive insects and report them. These topics will be covered in the classroom, followed by a hands-on lab to learn how to identify signs of shot hole borer damage, set up a monitoring program, and sample trees. CEU’s from the Department of Pesticide Regulation and the International Society for Arboriculture will be available. Every Cambrian lives in the forest. We share our landscape with the trees and wildlife. 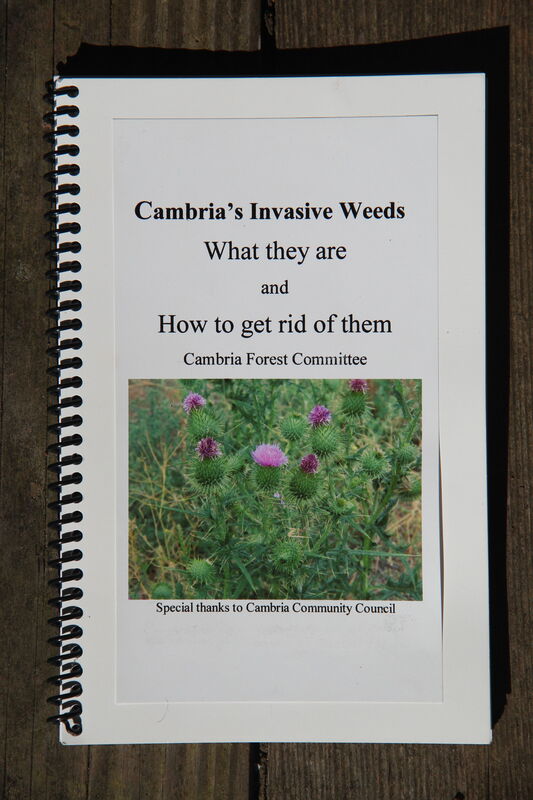 Donate now to the Forest Committee to defray publication costs of Cambria’s Guide to Invasive Weeds. Send a check for $8 (or more) to Cambria Forest Committee, PO Box 23, Cambria, CA 93428. Weeds are taking over landscape and crowding out native plants. Weeds hurt the forest by changing the habitat for wildlife. they increase fire danger. Pull weeds on your own property and help your neighbors. Every weed you pull reduces the number of seeds that will sprout on your property next year. Connie Gannon, executive director of Greenspace–The Cambria Land Trust and a member of the Forest Committee’s board, wrote about it in The Cambrian. Learn more about Cambria’s Invasive Weeds by joining iNaturalist on your tablet or smart phone. Find the Rogue’s Gallery of Weeds and add your personal Worst Weed of Cambria. contact us at forest@cambriaforstcommittee.org with questions. Download a copy of the Forest Committee’s brochure, At Home in the Forest, from the Frequently Asked Questions page. A brochure on Sudden Oak Death is now available on the Frequently Asked Questions page. Read the Community Wildfire Protection Plan posted under Forest-Related documents. Volunteer to help the Cambria Forest Committee preserve Cambria’s Monterey Pine Forest. Would you like to pull weeds, get rid of those nasty invasives that are creeping into our forest? Do you have computer skills? Would you like to use your artistic talent to create informational materials that convey the forest’s beauty? What is your talent? The Forest Committee welcomes you. Contact us at forest@cambriaforestcommittee.org and we will put you to work. In 1985, The Land Conservancy was selected as the implementing nonprofit agency as required for government agencies to operate the Transfer Development Credit Ordinance. Following the completion of the Cambria-Lodge-Hill Restoration Plan, the TDC program received seed money from the state Coastal Conservancy to begin retiring lots. Lots retired from development are permanently restricted to open space and their development rights can be transferred to areas in Cambria where development is better suited and which will have a reduced impact on the health of the native Monterey pine forest. The County directs landowners who wish to exceed present county development standards to The Land Conservancy to purchase TDCs. That money is then used to purchase additional undeveloped lots and retire them from development, and the cycle continues. In March 2016, after a four year hiatus, the Cambria CSD accepted 52 lots from the Land Conservancy. That allows the program to continue. Read the news report here. The CSD established a Buildout Reduction Committee to move the program forward. Follow the committee’s progress at the tab above. The Organizational and Funding Options for Implementation for the Cambria Monterey Pine Forest Management Plan is now posted on the Forest-Related Documents page. The Forest Management Plan is also posted there. pictures of our Cambria forest. The Committee meets on the 2nd Wednesday of the month at 6:30 pm at Rabobank on Main Street in Cambria. Everyone is welcome to attend. Next Meeting: May 8, 2019, Rabobank, Cambria. 6:30pm Open to everyone.